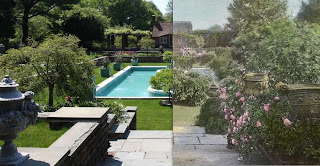 A mashup of the Italian Blue Pool Garden designed by Guy Lowell and Andrew Sargent between 1915-1918 at 'Planting Fields', the William R. Coe estate in Oyster Bay. Click HERE for more on the garden and HERE for more on the estate. Zach: An inspired post that indicates just how well the Italian Garden at Planting Fields has been restored. Landscape architecture is just about the most ephemeral of the arts, and its wonderful to see an instance of truly great design restored and preserved. Very off subject, but I picked up a book today titled "The Last Resorts" by Cleveland Amory, and right away reminded me of the folks that visit Old Long Island. Here's an excerpt. 1) Palm Beach. Not exclusive, but merry, sumptuous,and expensive. Chance to meet many men in the gambling rooms. 2) Hot Springs, VA. Depressing, but many "classy" invalids. 3) Narragansett Pier. Geographically speaking, this is nearly Newport, but the social tone, though "nobby", can hardly be called A-1. 4) The Berkshires. Dull and dowdy, but full of genteel old famililes in reduced circumstances who are willing to unbend-- if properly propitiated. 5) Tuxedo. Excellent opportunities here, particularly in the Tuxedo jiggers (i.e.,cabs) and at the club on rainy days, when a fourth is needed at bridge. 7) Newport. Having finally reached Newport, be very careful about the pace. Begin cautiously with Bellevue Avenue and the casino. Gradually,hoever, you may hit up the pace and try the golf club, Bailey's Beach, and, finally, you may dash past the judge's stand and weigh in at Ochre Point.